Black breathes new life into the franchise while retaining its trademark charm. He keeps the film vastly different from Jon Favreau’s previous installments by adding his own brand of action-humour and twists. Black combines spectacular action, comedy and drama to get you entertained and emotionally invested in his characters.From the jaw-dropping attack on Stark’s Malibu estate, his brand-new prehensile armour, to a mind-blowing airborne rescue scene, Iron Man 3 is every bit the superhero blockbuster you’d expect it to be. Just do not leave the theatre once the closing credits start rolling! Note: You may not like the film if you find solo super-hero films tedious post ‘The Avengers’! Iron Man 3 reversed the clock and made me into a child again. I clapped. I pumped my fist in the air. I can’t whistle but if I could, I would have made shrill sounds. Basically, I cheered with the uncontaminated enthusiasm of a five-year-old. What more do you want from a superhero movie? Iron Man 3 is popcorn entertainment in the best sense of the word. I’m going with four stars. Go, get a ticket and as always, wait until the end credits are done. There’s one last treat left. Yet what glorious clanging it is. Iron Man 3 boasts of the headiest of action setpieces, long and spectacular bits of movie wizardry dreamed up by grown men who like pushing their action figures to the limit. A lot of superhero movies look alike now, with increasingly incoherent action populating most of them, but this is a pleasure: these set-pieces feel like big, expansive, boastfully huge splash-pages. The kind of pages, also that don’t really need 3D conversion; I recommend you watch this film without the big glasses. From one True Believer to another, thank you, Shane Black. Iron Man has never soared higher. Iron Man 3 is funny, engaging, and has some really awesome action scenes. My biggest grouse about the film is its sloppy climax. We have the mandatory fireworks on display, but how about giving a closure or tying the loose ends of the plot before the big guns start blazing? Not only does the last half hour look rushed, but the Stark-Potts relationship deserved better handling. However, Iron Man 3 is a bonafide summer blockbuster that is your ticket to the most entertaining ride of the year so far. With characters culled from Marvel Comics, we know for sure that Iron Man 3 would be packed with spectacular action and nice razor sharp, witty lines. 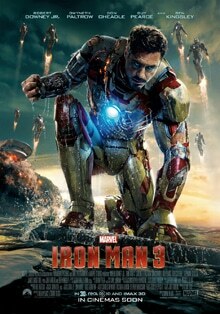 Iron Man 3 is the superhero’s journey of finding the demons he created and destroying them. Jam-packed with humour and gags, there is no emotional connect with the characters. During the course of the narration, director Shane Black and his co-writer Drew Pearce have meandered from the graphic novel into subplots merging the sensibilities of the eighties and early nineties, thus making everything odd in the character’s history. With a captivating finale, Iron Man 3 is a slick, inspired fantasy-adventure film that almost anyone can enjoy. Let’s pray for the next edition to come soon.